MBOX file to Office 365 Migrator is a simplified technology for moving multiple MBOX data files to Office 365 user account. With this software, it becomes very easy for users to upload MBOX to O365 files in an effortless manner into Microsoft cloud. 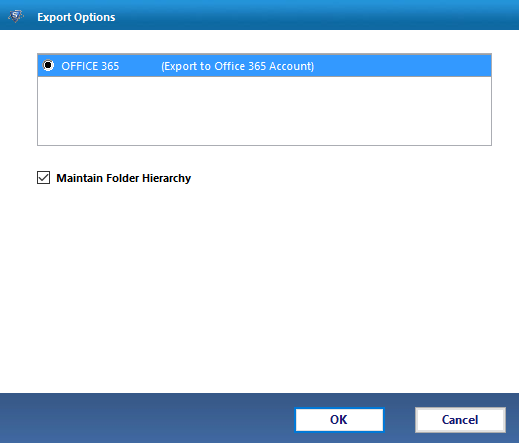 Import MBOX to Office 365 using Batch Mode option. 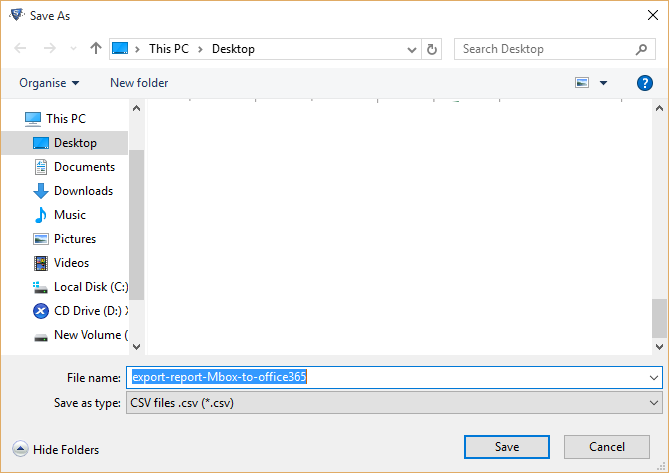 Add File(s)/Add Folder(s) to export MBOX into Office 365 easily. Supports Categories option to add all MBOX emails into cloud account. 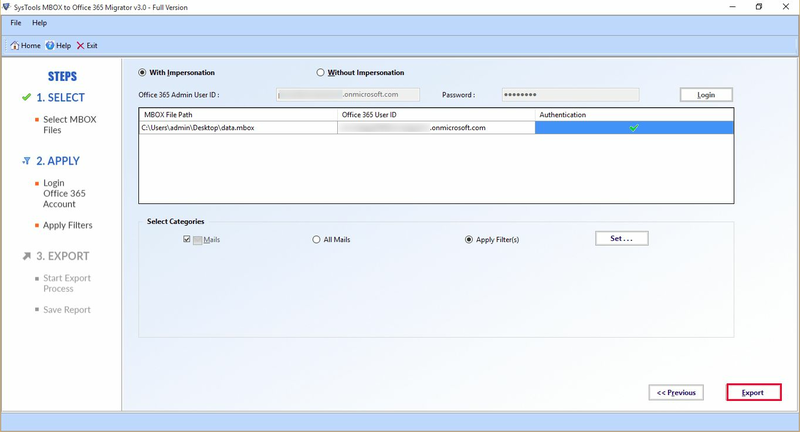 Perform mailbox migration to Office 365 With or Without Impersonation. Transfer Selective MBOX file to O365 with Date Filter. The MBOX to O365 Converter is compatible with all MS Windows versions like Windows 10, 8.1, 8, 7, Vista, XP, etc. to migrate .mbox files into Microsoft Office 365.
and all the Below Editions. 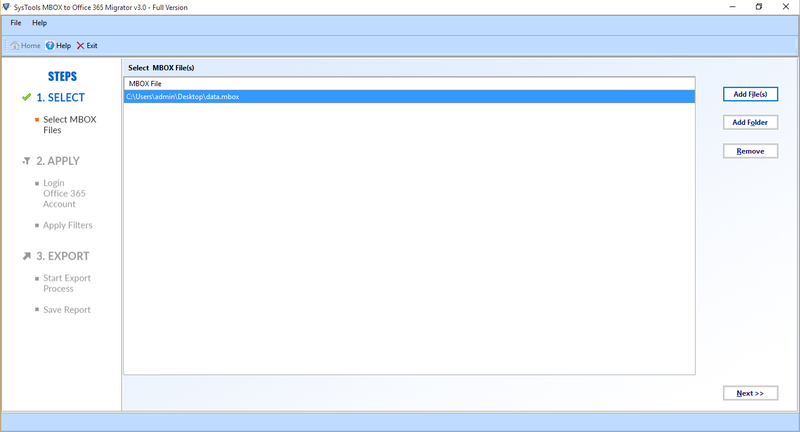 Shift Associated MBOX Data File into MS cloud of any email client. Support In-built Date Filter to move Multiple MBOX file to Office 365 by date. This Migrator Tool is developed in order to upload MBOX files in Microsoft Office 365 account with a trouble-free manner. There is no need to choose one file after the other as it has the ability to convert the files in bulk at once. Users just need to launch the tool in the machine and then they can perform the migration. The software has been created in such a way that it supports shortcut keys. This means that if users wish to choose more than one MBOX file for uploading the data, then they can use this tool. It allows users to choose multiple MBOX with CTRL button. Therefore, with this, the procedure of moving MBOX to Microsoft cloud can be achieved quickly. 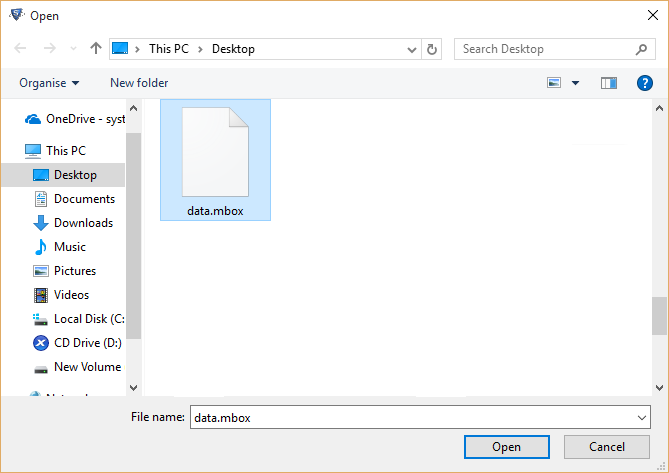 There are some users who has unhealthy or deleted file and need to upload MBOX files into Office 365, considering their need this feature is added to the tool. It is possible to shift damaged file through this advance utility. Apart from this, users can even convert deleted MBOX files. They can transfer these folders with removed email like inbox.mbox, sent items.mbox. Add File: This option permits for adding single or multiple MBOX files into Office 365 account. Add Folder: This option permits for adding single or multiple MBOX folders for uploading them into the account of Office 365. The application has the capability to move the only the chosen categories. According to this, if users want to pick some specific emails then they can go for date filter option. On the other side, if they require all the files then they can perform the files conversion in that way also. The software works according to the need of the users. As we know, SBD is the file, which is created for every folder separately. By using this utility, users can export SBD to Microsoft Office 365 account in a direct manner. 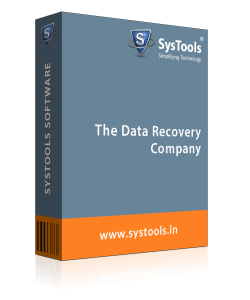 The product is capable enough that it can even migrate the database in bulk. Moreover, the task of moving files becomes simple and quick with this MBOX file to Office 365 migrator. MBOX to Office 365 Migrator Software comes up with one more unique and eminent feature. 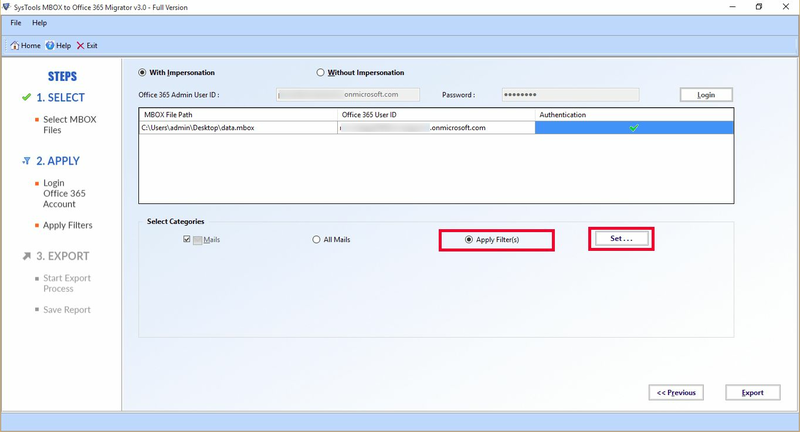 According to this, users can upload/export mailbox to O365 with or without impersonation. In with impersonation, it need to put the Admin User ID along with the password and then it can transfer multiple mailboxes easily. Without impersonation, one need to put the password for each mailbox. Apart from all the available features of MBOX migrator, this option has its own importance. For those users who want to get the folder structure in the same way as it was before the importing process, this is a useful option. With the help of this, they can get the same structure of the folder in Office 365 account. They just need to put a mark in front of Maintain Folder Hierarchy option for this. It is an optional feature and therefore, not mandatory to choose. Now, by using date filter option, users can import only the selective emails. Some users have a bulk of files and they do not want to waste their time in performing a complete conversion of MBOX files into O365. Therefore, in such circumstances, they can opt for this option. They just need to put the dates in the column of “From” to “To” and then all the emails falling under that date range will be displayed by the application for migration. Utility to transfer MBOX file to Office 365 also supports the storage of CSV files. After the selection of data, users need to hit on Export. As soon as it is done, the process of conversion begins and the software displays the progress report of the procedure. 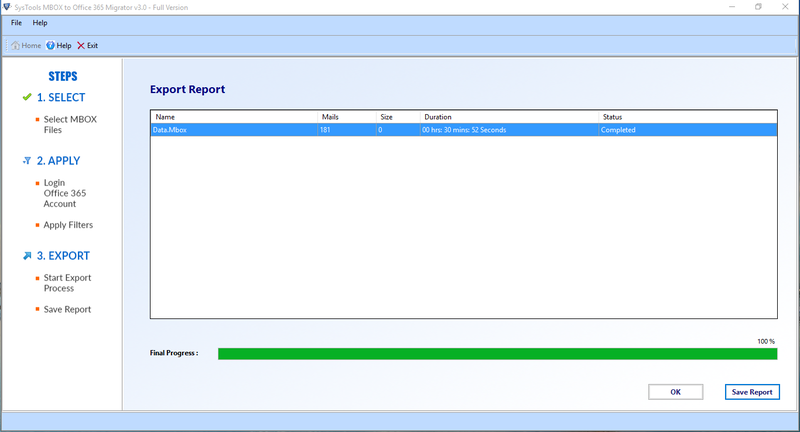 Once the conversion is done, they can now receive a completion report in CSV format. This is report can be saved by users in any of the location if needed. The utility makes the entire process to upload MBOX to Office 365 simple. Users can run the application in any of the editions of Windows Operating System. This means they run it on Windows XP, Windows Vista, Windows 10, Windows 8.1, Windows 8, and Windows 7. In addition, all their files remain safe and protected with the MBOX file to Office 365 Migrator tool. Step 1 : First, launch MBOX file to Office 365 Migrator in your machine. Step 2 : Now, click on Add File(s) or Add Folder(s) option. Step 3 : Go to the location of required MBOX file >> them click Open. Step 4 : Once it is done, the tool will display all the chosen MBOX files. Click on Next. 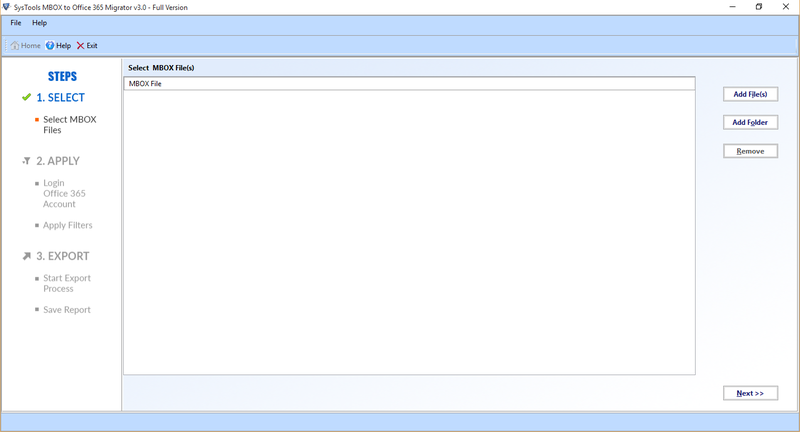 Step 5 : In the next displayed screen, you can view that the Office 365 Radio button is chosen automatically. With Impersonation: Click on With Impersonation option. 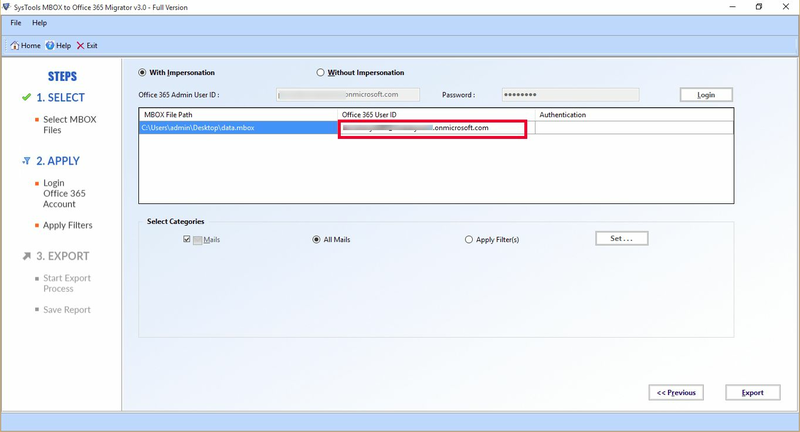 Then provide credentials for the Admin account and hit the Login button. The admin account is authenticated. Note: For selecting Without Impersonation: You have to press the without Impersonation option and have to provide the credentials of the mailbox to which you wish to migrate the data. The tool will authenticate the mailbox. Now continue the following steps. Step 1 : Once done the selection and its further necessary steps as explained in previous step, you can put the mailbox ID in which you need to import/migrate MBOX to Office 365 application. Then the mailbox id will also be authenticated. Step 2 : Choose the Filters for uploading MBOX file to Office 365. Hit on Apply Filters and then press Set button. Step 3 : Pick the Date filter as per your requirement and press Apply button. Step 4 : Then press Export button and it begin the process. Thus tool will start moving files from the MBOX emails to Office 365 account. The progress of migration will be visible to the user. Step 5 : As soon as the process gets completed, you will receive the confirmation message, then click OK in the displayed window. Step 6 : Then, you can see the Entire report with some crucial information such as Number of Mails, Status, & Size Duration in it. Hit on Save Report to store the report. 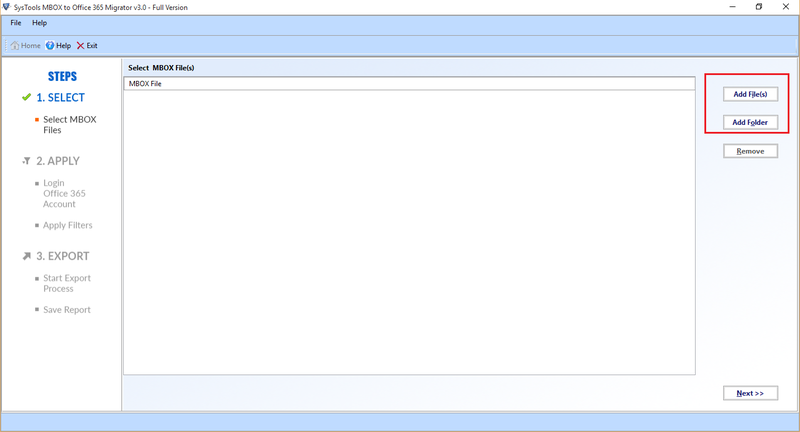 Step 7 : Choose the Desired location for saving the report after completing mbox file to Office 365 account. Step 8: The report will be saved successfully in the location with the message as shown in the image. Step 9 : You can open CSV file in Excel Sheet, if you wish to view the report. 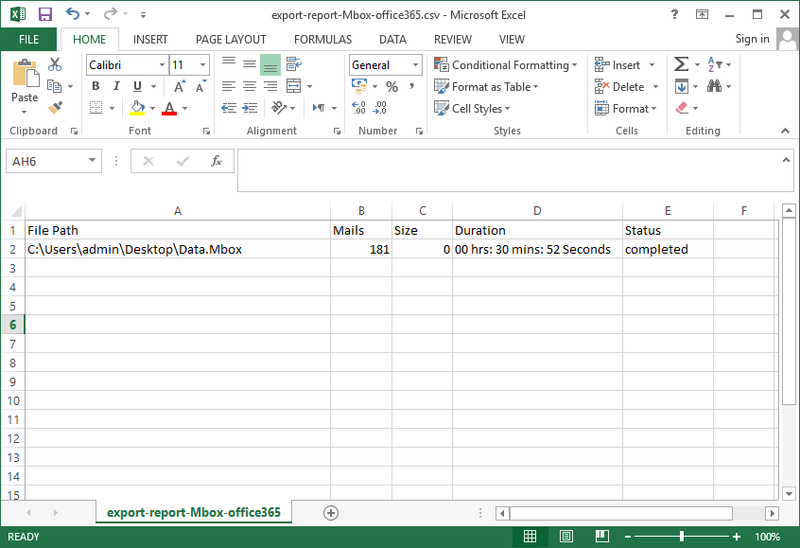 Step 10 : In the final step, you can see the resultant data of MBOX to Office 365 migration as shown in the figure. Watch!! How to Convert MBOX Files to Microsoft Cloud Account? Q. 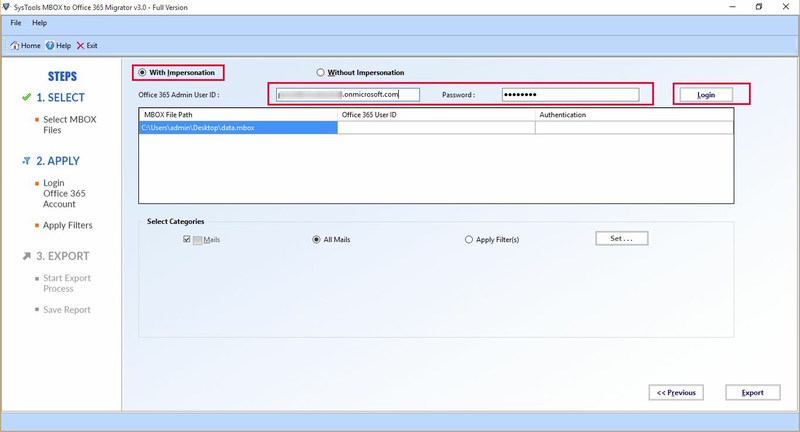 What Does Impersonation option signify in MBOX to Office 365 Migrator? Ans: In with impersonation, you need to put the admin user ID and password and after this, you can import multiple mailboxes. In without impersonation, you need to put a password on each mailbox. Q. Can I transfer emails from MBOX file to Office 365 account, which is falling under a certain date range? Ans: Yes, by Date Filter option, it is possible to choose only required MBOX emails and execute the migration from MBOX to Office 365 cloud account. Q. It is possible to import MBOX files into Microsoft Office 365, that are deleted via this utility? Ans: Yes, with its advance designing, our application is capable to move deleted MBOX emails effortlessly. Performing migration was not so easy for me before I found MBOX to Office 365 Migrator. Believe me, this is an exceptional program, which provides accurate results. It becomes so easy for me to import MBOX file to Office 365 account. I have encountered no difficulty throughout the procedure. I am very grateful to the entire team of developers of MBOX to O365 migrator for such a useful program. If I talk about the interface, then I must say that this software has a very simple and user interactive interface. I liked this product and would like to use in future too if there is the need. I have been inquiring a solution to upload all my emails to Microsoft O 365 account for a long time. I was concerned about the data safety. Fortunately, I got this software and have decided to migrate MBOX to Office 365 account. Believe me, I found the tool very helpful and it converted all my MBOX file to O 365.